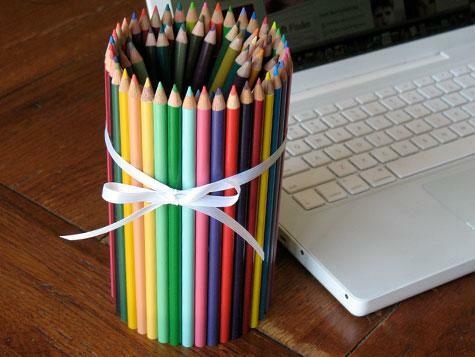 This colored pencil can is pretty and functional! What makes this holder special is that the pencils can be removed, used, and then pressed back onto the outside of the can. Paint can with white paint and let dry. Cut two strips of material long enough to wrap around the top and bottom of the can to create a decorative border. Attach with white craft glue. Roll the mounting putty in your palms and wrap around the center of the can. Press colored pencils into the putty, working your way all the way around the can. Tie a piece of ribbon around the can for a decorative touch. This project was created by Amanda Formaro, originally for Kaboose/Spoonful.